Mount Ishbel was named to honour the eldest daughter of British prime minister Ramsay MacDonald, who was in office in the United Kingdom from 1924 until 1935. His wife Margaret MacDonald died when Ishbel was a child, and when her father - who never remarried - was elected, Ishbel assumed the role of hostess at 10 Downing Street. She would later represent the Labour Party and become a respected politician. Her namesake peak is seen here rising serenely over a stand of aspens dressed in golden autumn glory. 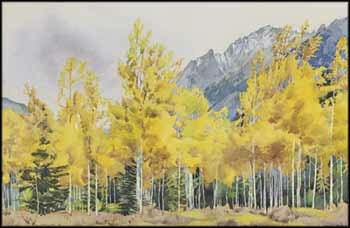 Walter J. Phillips was drawn to the colour contrast that these aspens provided, distinct against the otherwise predominantly blue, green, grey and white palette of the Rocky Mountains, and he painted views of the Sawback Range - of which Mount Ishbel is a part - often. It was an easy walk from his home in Banff to one of the many vistas in the wide open valley of the Bow River, where sunlight streamed in over the low, jagged peaks and brought the surrounding mountain scenery to brilliant, colourful life.